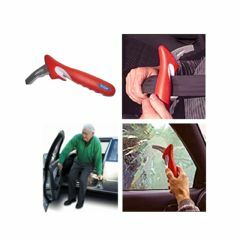 The Handybar Car Aid offers support to help you out of the car safely and securely. One of the most important applications of the Handybar Handle is the side window breaker. In the unfortunate event that immediate escape is necessary, use the seat belt cutter and free yourself, then simply strike the center of your side window with the pointed end in a hard snapping motion. The area opening will be large enough for you to get out of your vehicle and into safety. The Handy bar inserts into the U-shaped striker plate on your vehicle door frame. This U-shaped striker plate is one of the strongest parts of the vehicle and is designed to keep your vehicle door closed in the event of a side-impact collision. The Handybar 3 in 1 Car Aid uses this strong-point on your vehicle as a simple insertion point that creates an instant, easy to operate "support arm" for exiting the vehicle. There is a striker on each of the vehicle's door pillars allowing the Handy bar® to be used on both driver and passenger side-doors. Just like biometric principles practiced by Olympic gymnasts, the Handy bar provides a leverage point creating what is known as a "mechanical advantage", allowing the user to move more easily from a seated position in a vehicle to a standing position with a fraction of the typical difficulty or strain. Reduce the amount of exertion and risk of injury or accident by using a Handybar to exit your vehicle. Ensure your vehicle has two bolts or screws attaching the striker to the door frame. If your vehicle has a light switch in the striker, be sure the Handybar Car Aid does not interfere with its operation. Click here to see a video of how the Handybar 3 in 1 Car Aid works. Used by dementia patient to enter car. Safely supports his 200 lbs. when he is leaning in a downward direction; however, the tool wobbles in the car latch when he lifts his hand upward or to the side. Bottom line: the tool certainly helps, but I have to make sure it doesn't wobble as he changes his grasp. From product description-you'd think it easily fits most cars, I tried it on 2 - a 1994 car and a 2008 car (both US Mfg)- it didn't work on either one. I donated it to a Veterans Treatment facility in case someone else could use it on their car. Safe. Sturdy. Easy Storage. Supports Weight. Easy To Use. Well Constructed. Caregiver. Elderly. Long Term User. bad knees. I bought this product more than 10 years ago from an ad on TV, the only item I ever bought from an ad on TV. My friend, that we took care of in our home, used it for over 9 yrs before she died. My mom who is 88 still uses the one I bought on this web site. Every time I have had to take my mom to the emergency room, about 10 times in the last three years, the nurses in the emergency room who help us back into the car are really impressed with the Handybar and want to know where I bought it. I keep the original one in my car, and my mother's part-time caregiver has the new one in her car. Supports Weight. Easy To Use. Well Constructed. Sturdy. Safe. Persons who have balance . Weakness and imbalance. Husband had brainstem stroke. Is 6 3 and 250 lbs. this helps him rise from car seat to walker safely. Lightweight. Supports Weight. Stores Easily. Easy To Use. Well Constructed. Safe. I AM A LARGE MAN WITH ARTHRITUS AND HAVE DIFFICULTY GETTING OUT OF THE CAR. THIS TOOL HELPS ME AS IF IT WERE THE ARM OF A CHAIR, AND I PUT MY WEIGHT ON IT SO I CAN EASILY STAND UP. will handy bar help person who has easily dislocated hip to get out of car safely? How easy is it a woman to use Handybar 3 in 1 car aid. I am having a problem getting out of my car which mean I can no longer drive. It works GREAT! Very easy to use. Just open the car door, put Handybar in place, get into car, remove Handybar and close the door.